On October 18, 1867, the Russian Empire formally ceded Alaska to the United States. The next month, St. Innocent was elected Metropolitan of Moscow. Shortly after this, Innocent sent the following letter to the Ober-Procurator (the Emperor's representative) of the Holy Synod. Do not close the American vicariate—even though the number of churches and missions there has been cut in half (i.e., to five). Designate San Francisco rather than New Archangel the residence of the vicar. The climate is incomparably better there, and communications with the colonial churches are just as convenient from there as from New Archangel (if not more so). 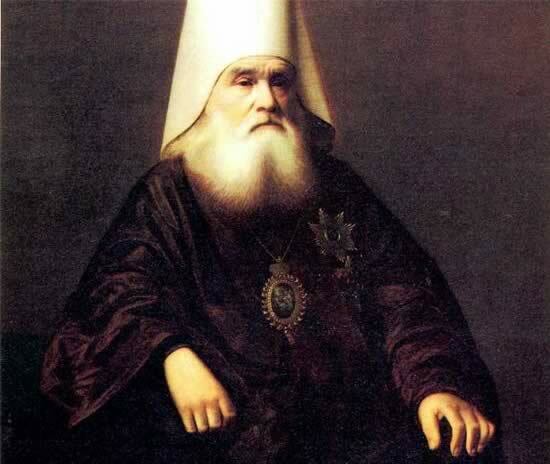 Subordinate the vicariate to the Bishop of St. Petersburg or some other Baltic diocese, for once the colonies have been sold to the American Government, communications between the Amur and the colonies will end completely and all communications between the headquarters of the Diocese of Kamchatka and the colonies will have to be through St. Petersburg—which is completely unnatural. Return to Russia the current vicar and all clergy in New Archangel (except churchmen) and appoint a new vicar from among those who know the English language. Likewise, his retinue ought to be composed of those who know English. Allow the bishop to augment his retinue, transfer its members and ordain to the priesthood for our churches converts to Orthodoxy from among American citizens who accept all its institutions and customs. Allow the vicar bishop and all clerics of the Orthodox Church in America to celebrate the Liturgy and other services in English (for which purpose, obviously, the service books must be translated into English). To use English rather than Russian (which must sooner or later be replaced by English) in all instruction in the schools to be established in San Francisco and elsewhere to prepare people for missionary and clerical positions. (New York: St. Vladimir Seminary Press, 1979), 275-277.